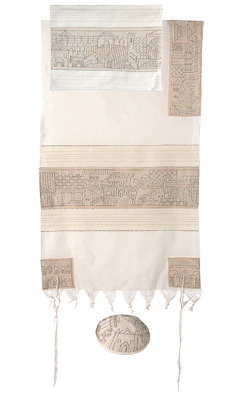 Tallit CAT# TFE- 2, 61" X 75"
Product Title: Tallit CAT# TFE- 2, 61" X 75"
Jerusalem in Silver Tallit Hand Embroidered Atara Stripes and Corners CAT# TFE- 2 . size: 61" X 75". made of hand – woven cotton. The motifs are hand – embroidered on a separate piece of raw cotton fabric using various colors of silk, gold and silver threads. Many Tallitot have black or blue stripes that are said to represent the Techelet. Many Sephardim wear plain-white tallitot. Hasidim prefer shawls woven out genuine (Yiddish: Echt) Turkish wool. These tallitot have 5 stripes with the middle stripe being larger than the others (as seen in the photo of the Zidichover Rebbe). From the four corners of the tallit hang fringes called tzitzit, in compliance with the laws in the Torah (Book of Numbers 15:38).